- Minutemen Ending - Always ready! Help the valiant Minutemen under Preston Garvey and bombing away the Institute! - Brotherhood of Steel Ending - Ad Victoriam! You join the Brotherhood of Steel and dismantled the Institute with a giant fighting robots! - Railroad Ending - Think it out one on the synths! The Railroad has its own plan and wants to rid the synths as well as blow up the Institute and get rid of the Brotherhood. - Institute Ending - For science! Despite all misconceptions you stand on the side of the institution and to its plan for the future to pull, unfortunately the other groups have gone. Below we show you what happen when you decide on each one of these fractions. In addition, we've embedded a video of the whole end sequence. 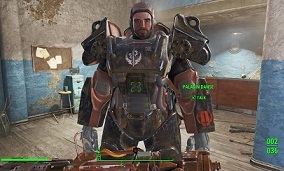 As valiant Minutemen militia you have got a high-tech army, including killer robots, but once you have accessed to the Institute during the quest line, it's all about the same as with the Brotherhood. Fight through the synths to the reactor chamber and place the bomb. Then teleport away and enjoy the mushroom cloud on the horizon. The Brotherhood of Steel is a military organization and they represent old American values. What they don’t like, are mutants, synths and technology in the wrong hands. Therefore, they have a huge problem with the institute. Once you have completed all the quests here, you’ll have the option to join Paladin Danse. The Railroad wants to rid the synths and destroy the institution and the Brotherhood of Steel. You go to the Institute and incited the synths to revolt. In the Chaos you run to the reactor room and place a bomb. From the teleporter get out of the danger zone! After that you can go to Desdemona. If you have decided on the institution, then pursue all the quests from Father. Destroy the Railroad and Brotherhood of steal and take control of the Institute. But be careful, especially the Brotherhood of steal charges you with its best paladins and knights! After that you can go to Shaun and carry out one last conversation with your son.